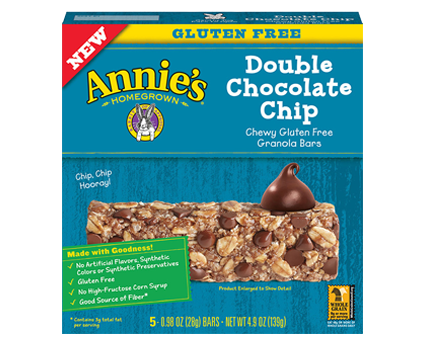 One of our favorite brands, Annie's, has come out with two new granola bars and they are both gluten free! The two new flavors are double chocolate chip and oatmeal cookie. As is typical of Annie's products, these bars contain no high fructose corn syrup, no artificial flavors, and no synthetic colors or preservatives. They are the perfect breakfast treat or midday snack and are great to bring with you on a long day out, as they are individually wrapped. These granola bars are also a great source of fiber! To purchase Annie's gluten free granola bars, check out your local Whole Foods or health food store!